In 2013, we were contracted to renovate 30-34 Tyndalls Park Road, by upgrading the timber sash windows and supplying timber fire-rated doors. As part of the University of Bristol’s extensive renovations of period housing, offices and classrooms, we were invited back to undertake the restoration of 15-19 Tyndalls Park Road. Products installed: Sliding sash windows with horns and traditional locks, four-panel wooden fire-rated doors and period timber features, including skirting boards, dado rails and picture rails. The project consists of the complete refurbishment of three adjacent and connected four-storey Grade-II listed Victorian villas to provide facilities for the School of Economics, Finance and Management. 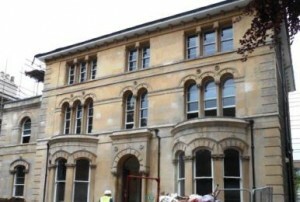 These buildings were acquired by the university in 2013 from the BBC as part of their project to convert this area in Clifton into the social and educational hub of the university. Our works consisted of refurbishing and upgrading approximately 90 sliding sash windows to match the existing windows like-for-like, including some with arched tops. We refurbished original single-glazed windows, while replacing others with slim-line and energy efficient double glazed timber sashes. We also supplied and fitted approximately 120 four-panel fire doors to match the originals, along with associated linings and architraves. We’re also supplying a variety of skirting boards, dado rails and picture rails, to match the original period features removed whilst the building was used by the BBC. Wessex Restoration is a specialist period house renovation company based in the heart of North Somerset. Although we specialise in manufacturing traditional box sash windows, we can create any size or shape wooden windows in our joinery workshop. No matter how big or small your restoration, we can supply you with top quality timber products made from the highest quality materials and treated to perform for years to come. You can also specify other timber products with us, including fire doors and other timber period features.